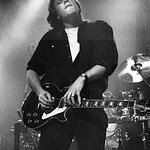 Guitarist Jeff Healey was blinded by eye cancer at the age of 1. He performed many benefit concerts to aid eye cancer charities. Healey lost his lifelong battle with cancer on March 2, 2008. Jeff Healey has passed away, but we remember his charity work. Google trends for "Jeff Healey"
We don't have any videos related to Jeff Healey.